Over time concrete will develop surface imperfections, cracks and discolour, making your concrete surface and property look dull and drab. Do you have an existing or new concrete space which needs a refresh? There are many options available for transforming plain or tired looking concrete areas such as: concrete patios, concrete driveways and concrete pathways into a fresh new contemporary decorative concrete or colored concrete surface. If your concrete is in good condition but just needs a facelift, you can also stain, stencil or engrave it to improve the appearance. Resurface coatings bond rigidly to existing concrete surface and help create a slip resistant, textured, decorative surface with excellent durability and abrasion resistance. Thundercrete provide a complete concrete resurfacing service which is flexible and cost effective with a range of colours and finishes to choose from. Check out our range of Stenciled Concrete and Coloured Concrete finishes. 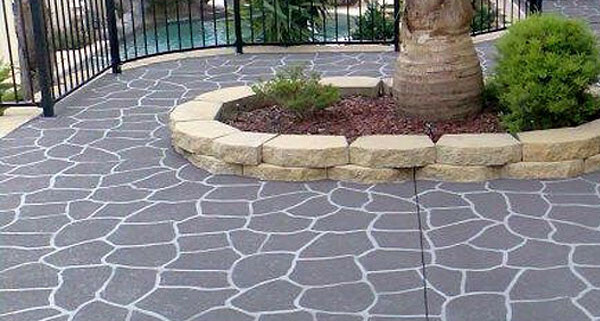 Call Thundercrete on 0410 859 829 to arrange an inspection and consultation on resurfacing your concrete surface in Brisbane, Gold Coast or Sunshine Coast.